One thing I have always marveled at about the trading card industry is how willing hobby shop owners and collectors are to frequently “pay it forward” to other collectors they have never even met in person. I frequently hear stories about collectors sending free cards to other collectors they need to fill in their sets or of players they collect. And with more and more collectors meeting online, it seems to be happening more frequently. But why are collectors so friendly to people they don’t even know? I believe it stems from the understanding by most collectors of just how difficult it is to complete a set. It’s a great feeling to complete a set so to be able to help another fan do the same, you get to share that feeling with someone else. With “mojo” being such a frequently used term in the industry, perhaps some collectors feel that by doing good to others, it will somehow have a karmic role in what they find in future packs. Whatever it is, it continues to happen and it is really something that is unique to the hobby of collecting trading cards. Putting together a master set of cards takes a lot of time and help. More and more stories are surfacing of collectors helping other collectors and not asking for anything in return! “I put a post up about my Ovechkin collection on one of the trading forums that I used to live on, with a story of how I got to go see him for my Make-A-Wish. A guy I’d never had contact with before asked for my address and said he had something he thought would look good in my collection. He sent me a 16×20 autographed framed photo of Ovechkin holding his ’50 Goal’ puck with a note on the back saying, ‘Rob, Hope you like this. You have an amazing Ovie collection and I wanted to add to it. Hope you are feeling better. 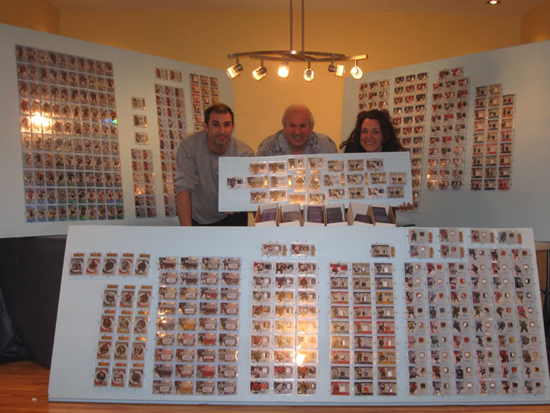 Take care, Mark.’ Hand down the nicest thing any stranger has ever done for me.” – Rob T.
“A collector on a few forums jumpstarted both my Bouwmeester and Noreau personal collections. After that there was another collector who, while I was sick, sent me a really nice Bouwmeester patch/jersey card for my personal collection and also sent a card to Bouwmeester through the mail that he signed and sent it on to me. I’m grateful for bother of those people and countless others that have sent me unexpected little surprises. Thank you!” Griffin G.
“I asked on a forum what product I should start my son on who wanted to start collecting baseball cards and Chris Olds sent my son his very first autograph card of Johnny Cueto.” Rich C.
“I once had a fellow Robin Yount collector send me two huge boxes of extra graded and oddball Younts for my collection. Most incredible thing and he never asked for a thing in return.” Mark E.
We want to encourage collectors to continue to keep this hobby so friendly. Do a good deed for a collector you chat with online or see in the shop. It may give you good “mojo” for your next purchases, but more than anything, it will make you feel good helping others. Let’s continue to shine a light on all the good in this hobby!